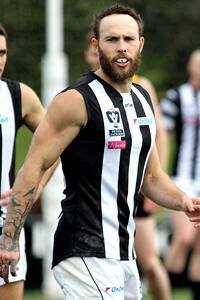 Brent Macaffer played 17 games for the VFL Magpies in 2016. Photo: Shane Barrie. 2008: Brent Macaffer won the Joseph Wren Memorial Trophy as a fresh-faced 20-year-old yet to play his first AFL game. 2016: Brent Macaffer wins the Joseph Wren Memorial Trophy as a 28-year-old after playing his last AFL game. There’s been plenty in between the bookends, but after fully embracing a finals-bound VFL campaign, there is no player more fitting for the best and fairest than Macaffer. The season began with hopes of cementing a place in the Magpies’ AFL team. After finally overcoming injury concerns, a fully-fit Macaffer capped off a strong pre-season by being named in Collingwood’s leadership group in February. He was one of the most highly-regarded members of the playing group, but was the 2010 premiership player in the best 22? “We have picked up a lot of new guys and a lot of them play a similar position to what I play and watching last year I was thinking ‘jeez these guys are good, how do I fit in here?’,” Macaffer told The Age’s Michael Gleeson in February. Unfortunately for Macaffer, his doubts became reality in round three when he was omitted from a Collingwood side set to take on St Kilda. Yet rather than wallow in self-pity, he attacked his role in the VFL with passion and enthusiasm rivalled by few players. Rarely was there a pack without Macaffer at the bottom of it, a scuffle without him in the thick of things or a team meeting without his leadership shining through. 23 disposals led to a place in the best in his first VFL game, before a string of best on grounds followed. The midfielder led the Magpies in wins over Williamstown (26 disposals, eight marks), Richmond (26 disposals, 10 tackles) and Geelong (29 disposals, 16 tackles) as winning became a habit for Dale Tapping’s side. Collingwood won 12 games in a row between rounds six and 20 and Macaffer was far from the only valuable contributor. Jarrod Witts was dominant in the ruck all season, while Jordan Kelly was named on the half-back flank in the VFL Team of the Year for an impressive first season in Black and White. Yet after 15 home and away games and two finals, it is only fitting that the retiree ends his Collingwood career with an accolade truly deserved. He may not have received the VFL premiership glory he so desperately wished for, but in the Joseph Wren Memorial Trophy, Macaffer has a memento to recognise his skill, work-rate and desire to compete until the end.